Only 1,363 E-Code cars were ever made! Highly collectible and a rare Bird! This 1957 Bird has the E-Model or E-Code engine - 312 ci with 270 HP and dual four-barrel carbs. This car has an automatic transmission, power steering and power brakes, Power-Lift windows, Dial-O-Matic 4 way power seat, and soft and hard tops. Included is a Town & Country Radio, Deluxe Deck mounted antenna, and MagicAire Heater. Recently underwent a high quality re-paint. The evolution of the Thunderbird took a leap forward in 1957 when the Ford designers were tasked with improving this boulevard cruiser/sports car. Restyled grill, stretched rear sheet metal, fresh bumper designs and improved seating. Less visible improvements included larger openings for improved cooling, revised spring rates, larger brakes, stiffer chassis crossmembers, a 12-volt electrical system and new 14” wheels. The created a more stable and capable handling Thunderbird, with its spare tire back in the trunk. This was the last year of the 2 seater Thunderbird. This vehicle is located at Atomic Motors Classic Car Sales and Restorations in Henderson, NV just 20 mins from the fabulous Las Vegas Strip. Come down and see us or call at 702-826-3811 or 702-556-0888. 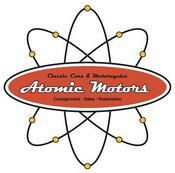 We are on-line at www.atomicmotors.net where you can see more pics and information.